Outside of the motocross world, George H.W. Bush officially took office in the White House, Seinfeld debuted to little fanfare on NBC, and the Exxon Valdez ran aground in Alaska, spilling millions of gallons of oil in what was then the nation’s largest oil spill ever (until last year, of course). In baseball, the San Francisco Giants and Oakland Athletics squared off in “The Battle of the Bay” World Series, but unfortunately the Bay Area was rocked by a massive 6.9 earthquake moments before Game 3. The motocross world was shaken up big-time at the AMA National opener at Gainesville, Florida in March. In fact, one could argue that the 1989 opener resulted in more changes to the sport in one day than any race ever. How so? Read on! 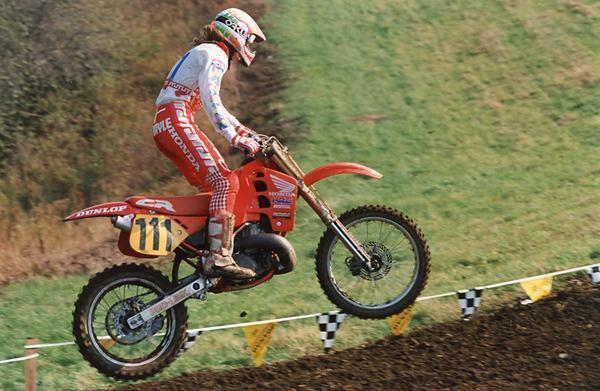 Coming into the ’89 Nationals, Honda’s Rick Johnson was the unquestioned leader of the pack. RJ pretty dominated AMA Motocross and AMA Supercross in 1986, '87 and '88, and he started the ’89 season by winning the first five races in AMA Supercross. His long-time rival Jeff Ward started the year injured, and while RJ had helped groom his new Hon teammate Jeff Stanton into a formidable force, there was no doubt that the “Bad Boy” was still as good as it gets when it came to winning races and championships—seven for his career by this point. Until the opening round at Gatorback. In practice, RJ and Stanton were chasing each other around. RJ got too close to very-fast privateer Danny Storbeck, and the Texan landed directly on Johnson’s arm, breaking the champ’s wrist. Just like that, RJ was out of the series. Worse yet, the wrist injury would linger on, never improving to the point where Johnson could find his old level. That day at Gatorback was the day Johnson’s reign at the top ended. 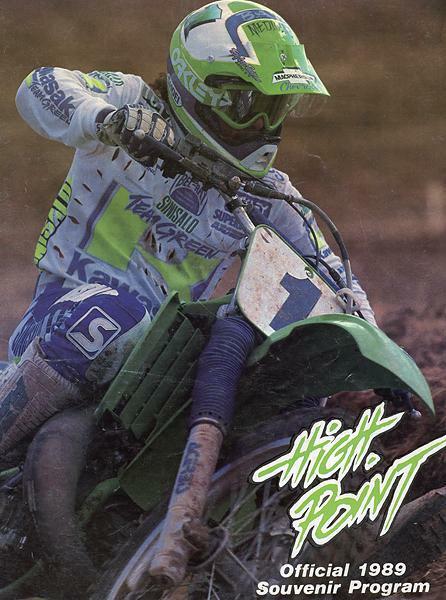 Jeff Ward graces the cover 1989 High Point souvenir program. So that was shocker number one. The next came at the end of the day, when Frenchman Jean-Michel Bayle romped to an upset victory in the 250 class. Sure, at the time JMB already packed credentials in the form of the ’88 125 GP Championship, but that accomplishment held little weight over in the U.S. Following the American takeover of the sport at the beginning of the decade, culminating with Motocross des Nations wins and World Championships, the idea of a French rider having any chance to run at the front on American soil seemed impossible. That’s why Bayle could barely even find support for his debut run in the U.S. American Hon’s Roger DeCoster “back doored” Bayle some stuff, but the effort was essentially run through Mitch Payton and a Pro Circuit box van. Bayle was on an production Hon CR250 versus the factory machines of the competition, and few thought of him as a contender (and if the idea of a foreign rider going after the Americans on a Mitch Payton-built production bike sounds familiar, well, yeah history tends to repeat itself). Wearing “Starbuster” on the back of his pants, Bayle won the 250 class at Gainesville. Stanton and Jeff Ward rounded out the podium. Bayle then went back home, dominated the ’89 250 GPs, then set his sights on American full-time for 1990. But you’ll read more about that over the next two years—for now, just know for sure that the Bayle win at Gainesville opened the floodgates for every non-U.S. rider we see over here today. This is a big deal! And losing Johnson was as well. 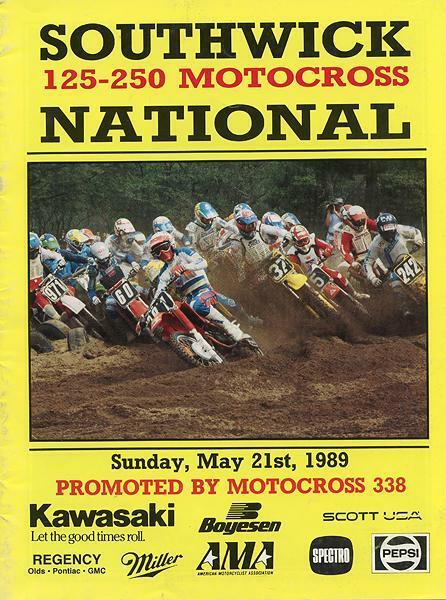 Stanton, who had spent the winter training at RJ’s house, quickly picked up the torch and out-dueled Ward for the 250 National Championship. Stanton won five nationals in a row after Gainesville, and then Kaw’s Ron Lechien continued his streak of every-once-in-awhile-he’s-untouchable rides by winning the 250 finale at Kenworthy’s in Ohio. A year earlier, Stanton was just a workhorse team Yam rider best known for decent finishes on a YZ490. To win both the AMA Supercross and AMA 250 National Motocross Championship the next year was completely unexpected. That's Pat Barton on the Southwick program cover. Defending 125 Champ George Holland was in the hunt all year, and another Hon rookie, Larry Ward, won a race, but most of the 125 battles boiled down to the crazy-fast—but crash-prone—Bradshaw against Kiedrowski and veteran Guy Cooper. And Cooper was so wide-open that he even made Bradshaw look smooth at times! There was no love lost between these three, the battles were intense and the interviews were candid. Several times, Bradshaw appeared to have the title on lockdown, especially after he dominated the Binghamton, NY round while wearing Hugo on the back of his pants (in tribute to Hurricane Hugo, which ripped through his native Carolina). But then Bradshaw would crash away a bunch of points and put Kiedrowski and Cooper back in the hunt. Bradshaw had a big crash with Ron Tichenor at Budds Creek, resulting in a busted rear break line and zero points in the moto. Kiedrowski took the points lead back heading into the finale at Unadilla, and while Bradshaw went 1-1 there, Mike rode consistently to claim the championship by three points. Kiedrowski thus went from 762 to number one in a single season—the largest national number jump ever! As for Bradshaw, no one was worried. He was clearly the future of the sport and would surely win many, many titles in the future. After the 250 class finished at Kenworthy’s, the 500s picked up starting at Binghamton. Stanton was the odds-on favorite since his best rides in previous years were on that Yam 490 air hammer. On a Hon works CR500, he was expected to waste the field. Instead, Ward, who had not done much more on a 500 in previous years besides get hurt a lot, found his groove on the big bike and won the title. Thus, Ward made history as the only rider to ever win the 125, 250 and 500 MX Titles and a 250 Supercros Championship. And with the 500 series long gone, that record will stand forever. Go Wardy! More changes came during the 500 series. 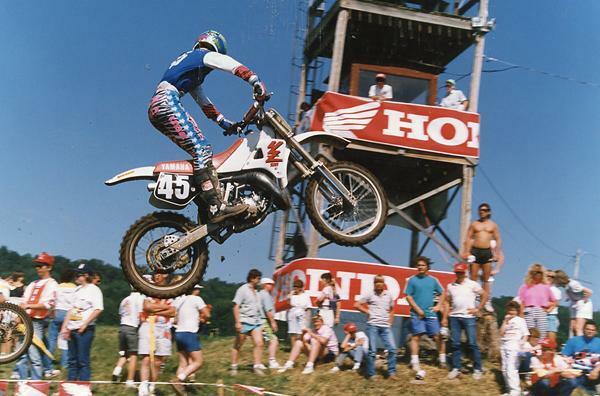 Lechien crashed hard at the Steel City round and broke his femur, an injury that knocked him out of the entire 1990 season and ended his days as a front runner. And Johnson and Bayle returned late in the year. Johnson did win the 250 USGP over the summer at Unadilla, but his wrist and hand were still giving him fits. 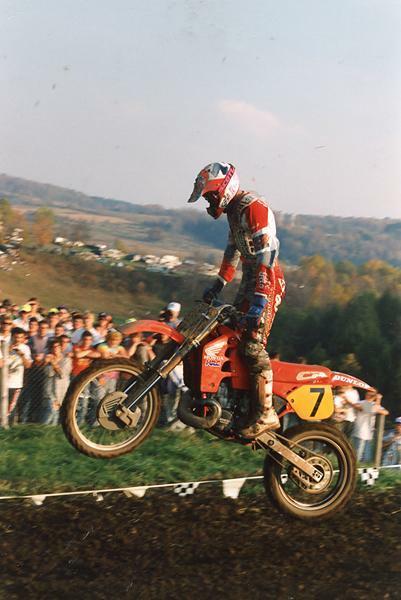 A few months later, Bayle returned and won the final 500cc National season finale in the mud at Unadilla. This JMB guy, clearly, was no fluke. As far as the facilities that hosted the races go, it was 1989 that Budds Creek in Maryland joined the schedule for the first time, exactly one year after Steel City joined in 1988. 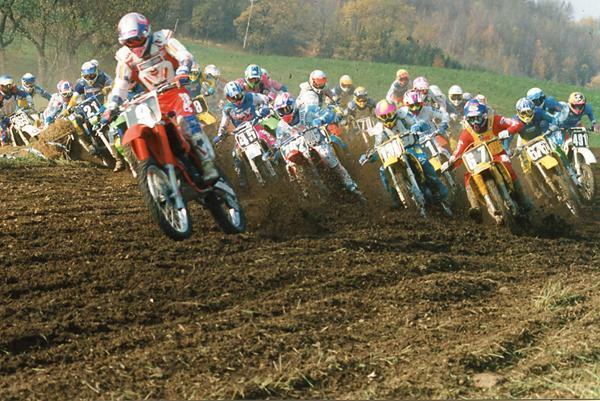 And after years of primarily focusing on Grand Prix and international races alone, Unadilla also joined the tour in '89, hosting both the U.S. 250cc Grand Prix and the last round of the AMA Motocross Championships. Add them up and these tracks were on the schedule in 1989 and remain on it 22 years later: Hangtown, Southwick, High Point, Red Bud, Millville, Washougal, Steel City, Budds Creek and Unadilla. At the Motocross des Nations, Stanton again picked up the mantle for Johnson, leading team USA to yet another victory, this time in West Germany. Ward and Kiedrowski represented well on the 500 and 125, respectively. Funny thing is, Kiedrowski only got the spot because Johnson was still expected to race, and the AMA was going to put him on a 125 in deference to Ward and Stanton winning titles on a 250 and 500. Johnson’s wrist troubles kept him out, so Hon just put Kiedrowski on the CR125 they had prepared. Ironically, while Bayle was winning races in both Europe and the U.S., a new crop of Americans were doing serious damage in Europe, too. Trampas Parker won the 1989 125 GP Title in what was a an even bigger shock than Kiedrowski winning in the U.S. Parker had gained little to no notoriety in the U.S., besides an amateur title at Loretta Lynn’s. And when he won that, he raced under his middle name, Chad, so when Trampas won GPs, it was literally the first time anyone had heard the name! Parker wasn’t alone over there. Fellow Yanks Bob Moore and Mike Healey also rode with Parker on KTMs and won GPs, as did Billy Liles in the 500cc class and even Broc Glover won a 250 GP on a KTM! The Yanks also had another big hitter about to head to Europe after his factory negotiations in the U.S. had broken down. But that’s for 1990. More tomorrow!